Exactly one year ago today, Selangor’s Islamic enforcement department (Jabatan Agama Islam Selangor or JAIS) raided the office of the Bible Society of Malaysia (BSM) and seized over 321 copies of the Alkitab, the Malay-language Bible, and the Bup Kudus, the Iban-language Bible. A few days later, the head of Majlis Agama Islam Selangor (MAIS) said that BSM had contravened Section 9 of the Selangor Non-Islamic Religions (Control of Propagation Among Muslims) Enactment 1988 because copies of the Bible distributed by the BSM contained the word “Allah”. The word “Allah” is among 34 words and phrases that non-Muslims cannot use in any circumstance, according to Section 9. In June, the Attorney-General announced that BSM’s Alkitab had not violated the Selangor law and that no further action will be taken against BSM. As for the detained bibles, he advised that JAIS should act according to law. JAIS and MAIS refused to return the bibles. In July, an old friend invited me for lunch. He said that he had been asked by parties representing the Sultan to inform us that the Sultan wanted to return of the Bibles. However, he did not wish to return the bibles in Selangor (where BSM’s office was) but asked if the bibles could be returned to BSM out of state, say, to East Malaysia. I informed my friend that I was no longer President of BSM but I would be happy convey this request to the BSM exco. BSM’s exco decided to accept the Sultan’s proposal. They saw this as an appropriate closure to this unhappy episode. BSM’s new president, Bishop Ng Moon Hing then met with the people representing the palace. Thereafter, BSM appointed East Malaysian Anglican Bishop, Bolly Lapok, to work out the logistics with the Sultan’s emissaries. By 6 August, this was accomplished in time before the meeting of the Conference of Rulers. The only thing left was for BSM to formally issue a letter appointing Sarawak’s Association of Churches (ACS) to accept the bibles on behalf of BSM. This was done on 9 August. The agreement between the Sultan and BSM was thus concluded. At this stage, it should be noted that other than the palace and BSM, no other party knew about or was involved in the negotiations to return the bibles. In particular, neither the State Government nor even the Federal Government were aware or involved. The quick return of the bibles was put on hold due to a crisis in the state. On 26 August, Menteri Besar (or the Chief Minister) Khalid Ibrahim resigned. His party, PKR, had been trying to unseat him for some time and eventually sacked him from the party. Anwar Ibrahim, the de facto head of PKR, wanted Wan Azizah, his wife and president of PKR, to be the new Menteri Besar. The Sultan did not agree but wanted a slate of names to be submitted for him to consider. Soon after that the Sultan went abroad. The squabble over the Menteri Besar’s post continued until the Sultan’s return. On 23 September, the Sultan appointed Azmin Ali as Selangor’s new Menteri Besar. The date for the handing over ceremony was chosen, 14 November. At the palace’s insistence only representatives from ACS would be invited. No West Malaysian, in particular, BSM, would be allowed to attend. However, last minute appeals resulted in Hermen Sheshtri, general secretary of the Council of Churches of Malaysia, being the only West Malaysian allowed to attend. Evidently, the new Menteri Besar had to be a participant in the ceremony. The week before the ceremony, Azmin Ali issued a number of press statements that he will be seeing the Sultan and will advise him to return the bibles and that the bibles will be returned by the following week. I was worried about the possible fallout of Azmin’s statements, particularly, that it will invite a backlash from Muslim extremist groups and scuttle the handing over ceremony. The effort over the past few months to keep this matter secret (including not posting on this blog) was at risk. Happily, news broke in the late morning of 14 November that the ceremony had taken place. Bolly Lapok led the delegation from ACS. 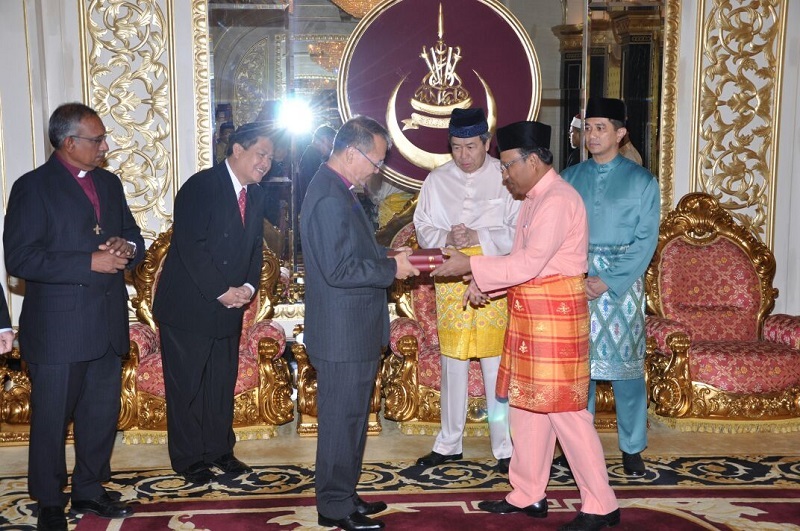 At the ceremony which took place in the palace, the head of MAIS handed over 2 copies of the bibles to Bolly Lapok under the gaze of the Sultan. Pictures were taken and released to the public and gentle warnings were issued that the Alkitab is not to be printed or distributed in Selangor. The head of MAIS (second from right) handing over 2 copies of the Alkitab to Bishop Bolly Lapok (third from left) in the presence of the Sultan of Selangor (third from right). 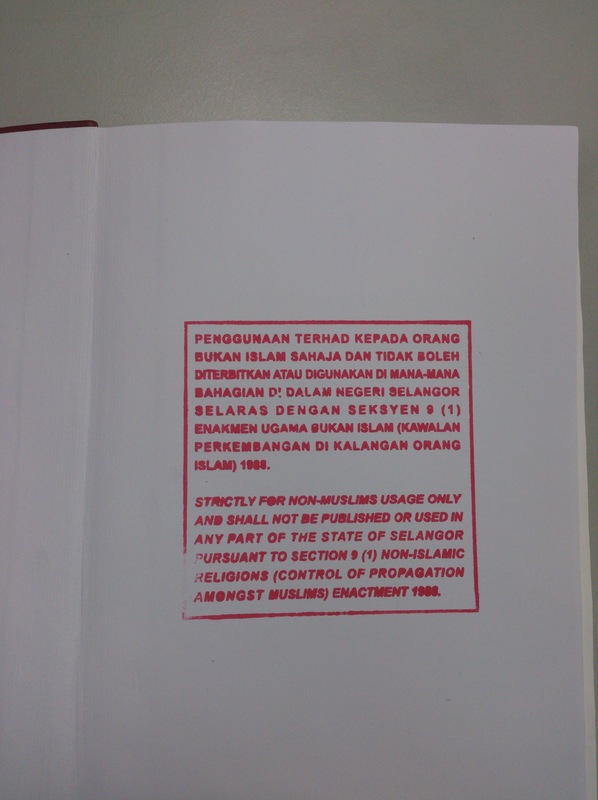 “Strictly for non-Muslims usage only and shall not be published or used in any part of the state of Selangor pursuant to section 9 (1) Non-Islamic Religions (Control of Propagation Amongst Muslims) Enactment 1988”. BSM’s exco was naturally infuriated. On 7 December, they issued a statement of protest and regarded the stamping of the bibles as a desecration of the Christian scriptures. Three years earlier, the Federal Government released a shipment of 5,000 copies of Alkitabs imported by BSM which had been detained for 2 years. On the eve of the Sarawak state elections, the government decided not to risk a backlash from the Christian voters of Sarawak. They announced the release of the bibles. The department responsible for seizing the bibles in the first place, obviously unhappy at bring forced to release the bibles, stamped the bibles as a parting shot. History repeated itself. On 11 December, an interview of the Sultan was published (link) indicating that he knew of and approved of the stamping of the bibles. The issue abruptly came to an end as no one wanted to involve the Sultan in this controversy. With this, the saga of the seized Alkitabs came to an uneasy closure. Coming back to our subject, why did Terengganu pass an anti-propagation law in 1980? In 1980, Terengganu was ruled by Barisan Nasional. The Prime Minister at that time was Hussein Onn who was also the leader of BN. However, Hussein Onn’s popularity in UMNO was at a low ebb (Wain, Malaysian Maverick, pp. 39-40). He was also very sick and in early 1981 had to go to London for medical treatment prior to his retirement. In his absence, Dr Mahathir was acting Prime Minister. Terengganu was a backwater state and the state legislative assembly was made up of Muslims. The passage of that law went unnoticed. In 1980, the country was in transition. It was preparing for a change of leadership. The Iranian Revolution in 1979 gave a new leash of life to many Islamic movements in Malaysia primarily PAS, the Islamic opposition party which back then agitated for an Islamic state. UMNO responded to the claims of PAS, as later events would show, by portraying itself as the true champion of Islam in Malaysia instead of PAS. Later on, the challenge of the country’s most radical Islamic youth movement, ABIM, was neutralised by Mahathir co-opting its leader, Anwar Ibrahim, into UMNO and the Government. In the 1982 general elections, Anwar defeated PAS in their own backyard to win a parliamentary seat. The passing of the Terengganu law in 1980 was the first demonstration of UMNO’s credentials as Islam’s champion. The war to protect the honour of Islam had begun. The following year in 1981, Kelantan passed a similar law. Kelantan at that time was under the rule of BN since the declaration of emergency in Kelantan in 1977 (by doing so, the Federal government was able to kick out the PAS-led state government). The next stage was the banning of the Malay Bible. Thus, at the end of 1981, the Home Minister issued an order under the Internal Security Act 1960 (ISA) to ban the Al-Kitab on the grounds that it was prejudicial to the security of the nation. Why? The Al-Kitab contained words which contravened state laws. An outcry from the Christian community in 1982 led to the Government modifying the ban into a partial ban. Thus, in 1983, a new order was issued by the Home Minister banning the Al-Kitab except for use by Christians in churches. Thus, the passing of the Terengganu law was necessary to criminalise the Al-Kitab’s use of certain words and provided the justification for the Federal Government to impose a nation-wide ban on the Malay Bible. By doing so, the UMNO-led government would be clearly seen as the champion and protector of Islam in Malaysia. In 1987, the nation tottered at the brink of communal violence due to an UMNO-MCA dispute over Chinese vernacular schools. Hundreds of people were detained without trial under the ISA. One of the groups of people detained were Christian evangelists accused of propagating Christianity to Muslims. It was in this atmosphere of religious paranoia existing in 1988 that the states of Kedah, Malacca, Perak and Selangor passed laws similar to that passed by Terengganu in 1980. Pahang followed suit a year later and in 1991, Negeri Sembilan and Johor also passed this law. It would be 20 years later in 2002 when Perlis became the the latest state to adopt this law. By the time the Federal Government took action to systematically restrict the importation of the Al-Kitab in the mid-2000s, they were able to argue that the words in question had been banned for a long time and the Christians had no business using it in their Malay Bible. Furthermore, this argument had been repeated so often in the Malay and Islamic media by UMNO politicians that in the minds of most Malays the word Allah was without doubt the sole preserve of Muslims. A recent survey by the Merdeka Centre showed that 77% of Muslims believe that Christians should not use the word Allah. Some pointers can be drawn from the above historical treament. Firstly, the ban on the use of the word Allah is the result of politics. Secondly, the danger of non-Muslims using the word was an idea manufactured by a political agenda and implemented by laws and governmental orders to convey the appearance of illegality. Thirdly, the anti-propagation laws were passed by BN-ruled states. Fourthly, when these states fell into the hands of opposition parties (eg. Kelantan, Selangor and Kedah), their was no interest or commitment by the opposition parties to undo these laws or to alleviate its harsh effects.